Combination of new microscopy and expansion tissue preparation methods facilitate better and faster analysis of subcellular neural elements. Today, the journal Science published a paper authored by a research team led by Dr. Ed Boyden of MIT and Nobel Prize recipient Dr. Eric Betzig of Janelia Research Campus. Among the authors are MBF Bioscience Scientific Director Dr. Susan Tappan and Senior Software Engineer Alfredo Rodriguez. In the paper, the researchers introduce new analyses for neural circuits at nanoscale resolutions. By creating enhanced processing and analysis tools in MBF Bioscience’s Stereo Investigator and Neurolucida 360 software, Dr. Tappan and Mr. Rodriguez analyzed these images to obtain comprehensive morphometrics of delicate dendritic spines at a greater accuracy than ever before. While several forms of microscopy exist that have the ability to image subcellular neural elements, scientists say that each of these methods is lacking in one way or another. According to the paper, the combination of expansion microscopy with lattice-light sheet microscopy gives the most effective results, while considerably decreasing the time spent carrying out the experiment. “I believe this type of imaging represents a major milestone in terms of the accuracy that can be achieved in dendritic spine morphometry from light microscopy,” Mr. Rodriguez said. In their part of the study, Dr. Tappan and Mr. Rodriguez first confirmed that physically increasing the size of the tissue did not cause damage to the internal structure, by analyzing 1,500 dendritic spines in seven layers of the mouse cortex that had undergone expansion. The larger spine heads and necks observed in layers four and five (closest to the somata) compared to layers two, three, and six, were consistent with measurements achieved in earlier studies. In order to ensure the technology would be capable of analyzing these extremely high-resolution images with accuracy, MBF Bioscience enhanced Neurolucida 360 so that the software would take advantage of the increased resolution rendered by the ExLLSM data. With the upgraded technology, Dr. Tappan and Mr. Rodriguez were able to more accurately reconstruct dendritic spines and obtain new morphometric values, such as spine neck diameter, for the first time. The enhanced software also gave them the ability to observe and measure the entire neck of the dendritic spine, identify each point where the spine attaches to its dendrite, and measure the extent of the head and neck along the spine backbone. While these measurements had been computed before, Mr. Rodriguez explained that the technology’s ability to offer such a high resolution allowed for more accurate results. To address the possibility that such high-resolution data might result in intracellular structures appearing granular, the developers integrated appropriate imaging filters into Neurolucida 360 to smooth the labeled dendritic structures prior to 3D reconstruction. 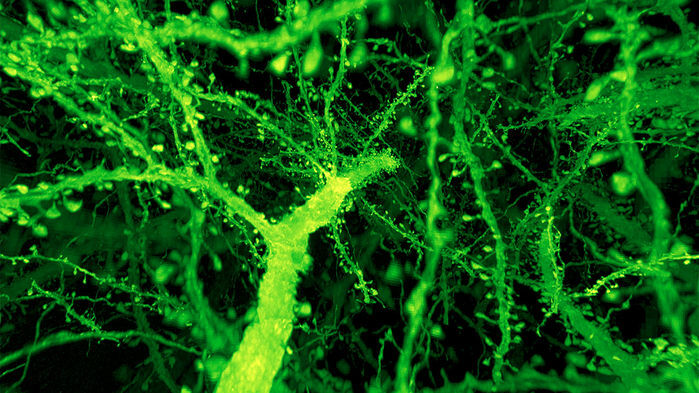 While the research team at MBF Bioscience focused on dendritic spine analysis in the mouse cortex, the study also describes a host of other analyses in this brain region, including the quantification of lysosomes and mitochondria, synaptic proteins, and the analysis of axon myelination patterns. In addition, the researchers imaged an entire fruit fly brain and traced neurons projecting into the part of the brain responsible for sleep, navigation, and visual memory. They also analyzed the axonal branches of olfactory projection neurons, observing differences in number and size of boutons — the tiny vesicles at axon terminals — in five different fruit fly brains. Finally, they measured distances between synapses, calculating density differences in various regions of the brain. Posted in MBF Company News and tagged expansion microscopy, Neurolucida, Neurolucida Case Studies, Stereo Investigator, Stereo Investigator Case Studies.